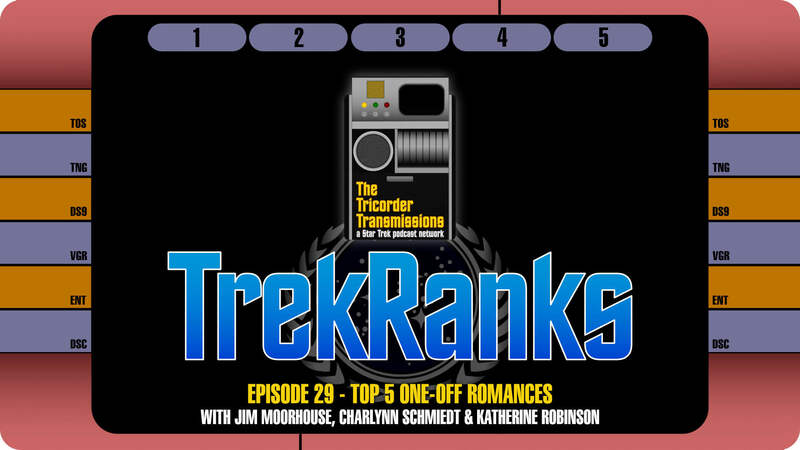 Lots of heartfelt emotion and heartbreak are on the docket in this week&apos;s TrekRanks, as we continue our "one-off series" with our Top 5 One-Off Romances. Host Jim Moorhouse is joined by guests Charlynn Schmiedt and Katharine Robinson to pick the best of Trek&apos;s one-appearance love interests! As often happens in our "one-off" episodes, the conversation delves into a number of episodes never before featured on TrekRanks. The Diagnostic Cycle on this week&apos;s show sees our team defining the rules for a one-off romance (Picard/Vash is out, Picard/Daren is eligible, and Martok/Sirella is up to you!) before locking in on how they narrowed down their picks with their personal Prime Directive. Jim, Charlynn and Katharine then break down their final picks in The Order of Things by revealing their "Five Word Summary and in-depth Hashtag" for each couple in their Top 5 One-Off Romances. The deep cut choices in all the lists show just how broad all the options were, and the picks get even more in depth when the crew calls up their Secondary Systems selections. After a quick recap of all the picks in the Regeneration Cycle, the episode concludes with a visit into a Temporal Causality Loop as we flashback to Episode 27 and our High-Concept Enterprise Episodes. As always, make sure to hail us here on our website by leaving a voicemail and record your own personal TrekRanks log to let us know your Top 5 One-Off Romances. Your comments might be used via a Temporal Causality Loop in an upcoming episode. And your recording might also be considered as an audition as a future TrekRanks&apos; guest host!